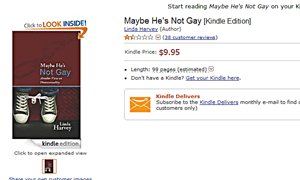 After inquiries by Back2Stonewall, Amazon.com has pulled the book Maybe He’s Not Gay from its website. The book was written by the founder of Mission America, Linda Harvey, is a right wing pundit and head of the organization that advocates fighting LGBT organizations. Alone and together we can make a difference. We just have to try. Westboro Baptist Church: We’ll Carry On Our Crazy Train Of Evil Hate Without Fred! It was actually easy peasy to get done. I don;t know why GLAAD makes it seem its so hard. Oh thats right I wasn’t trying to get money out of Amazon at the same time. I think we need a coherent and consistent approach to these things. Remember when eHarmony got sued for not providing their services to gay couples? Well, is it their right as a business to sell whatever services they want or is it not? Yes, it’s comparable: eHarmony’s “service” was that of matchmaking for heterosexuals (no different than matchmaking services targeted at Christians or African-Americans). For the record, I can’t stand Harvey (although Janet Mefferd is much, much worse). I’m just wondering what we would say if Amazon were to reject all gay literature for one reason or another. Would they have that “right”? We can’t say we support “freedom” on principle if it’s only freedom for us. James Bradshaw — I’m in reluctant agreement with you. Maybe it’s because I just turned 50 and it was virtually impossible to find anything gay positive in bookstores when I was a teenager in the 1970’s. (And when you did find something you’d be terrified to buy it. I grew up in the South.) Book banning can bite back. For example, when I was a teen, Anita Bryant and Jerry Falwell weren’t anything that I didn’t hear all the time around here. It’s why Harvey Milk and Harry Britt’s election to the San Francisco Board of Supervisors were lifesavers. Fortunately, it appears that it’s not that Amazon pulled the book, but that the publisher withdrew it. I guess they finally read it. You should know what this book is being offered online, in e-book edition, in Canada through Chapters|Indigo and through their Kobo E-Reader store. I’m on the phone presently to complain about this, but some letters of complaint would not go amiss. The book violates the company’s stated mission and is clearly a propaganda piece by a noted hate-group. It should be relatively easy to convince Chapters|Indigo that carrying the book is tantamount to peddling a homophobic pamphlet and tacitly agreeing with its contents. Pingback: Linda Harvey’s Book Pulled From Amazon | Joe.My.God.